First off, this blog entry is likely to be updated. Civil Discourse is welcome, but it is my forum, so if you post rants that descend to attacks, or spurious claims, you are likely to be deleted and banned. I was amazed today to see, on my Face Book time line, a lengthy thread about the destruction of the World Trade Center, on 2001/09/11. I had thought that after decades of debunking, the Conspiracy Theories had been laid to rest. Apparently not. So…I am going to touch on some aspects of that day and the events therein. I, oddly enough, had a bad night on the 10th, and had not been able to sleep, so I was awake at 7:30 or so when the report of the first plane hitting the tower came in. I immediately turned on the TV, and did little for the rest of the day except watch in amazement and some horror as events transpired. 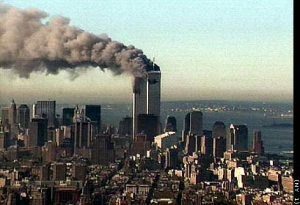 The images from that day are as clear today to me as they were 15 years ago as they first sprayed into my home across the airwaves. It was a very chaotic day for much of the time, as an event like this had never happened to America, and, we apparently did not believe that it COULD happen. There was, early on, commentators talking about how they could not understand why anyone would do this! It was like that first moment when one awakes, and has to pry eyelids, crusted together by the night open to see reality. We, as a society, were forced to confront the fact that America is NOT perfect, and that we do terrible things in the world for no reason other than expediency, or short term gain, or simple stupidity and misunderstandings of reality. No one likes to be confronted with their failures, and have their fantasy about their own perfection questioned, so, of course, many folks grasp at any straws they can in an attempt to avoid that ugly truth. America can be a “Great Society” and does have many positive moments. Look, for example, at the recent Wildfires in the East Tennessee area, and how we, as a people, have banded together to reach out and aid our fellow Tennesseans. We do not care who a person voted for. We do not care what their race is. We do not care how rich they are. We reach out to provide needed aid, and support in this difficult time. First off, let me touch on the motivations of the terrorists that flew the planes into the towers. This was not a surprise to the Intelligence community, as there had been traffic about Al Queda preparing for a big attack for months. At least once, Pres. Bush had a briefing report presented to him in the daily, morning intelligence briefing titled “Bin Laden Determined to Attack inside the United States”. Add to this the fact that Al Queda had attempted to bring the buildings down with a large car bomb some time before, and, it should have been a matter of concern. However, stupidity and poor judgement does not a Conspiracy make.Then..there are the claims about a controlled implosion bringing the buildings down. Evidence for this mostly comes from news reel footage giving close ups of the windows blowing out as the building collapsed. Let us look at the sequence of events, though. Airplanes, loaded with Jet Fuel, impacted the towers well up towards the top of the structures. This sprayed the fuel through several floors and coated TONS of flammable items with it. Jet fuel is not gasoline. It is more akin to OIL, so it does not flash off and burn rapidly as gasoline does. So, when it did ignite from any of the sources of sparks that showed up at the time, it burned slow and hot for quite some time before being consumed. This ensured that a LOT of flammable material was on fire. When the planes hit the towers, the skeleton of the building consisted of steel beams, coated with a spray on fire insulation. This insulation was designed to resist a “normal” fire, of the building’s contents igniting and producing a lot of heat. It was NOT designed to resist the pressures of tons of aluminum scraping by it, or, the pressure wave of air from the impact and subsequent ignition of the fuel. Steel, while it is very strong, deforms at temperatures far below its melting point. That is why Blacksmiths can take a half inch thick, steel bar, heat it to a bright, red hot, and twist it into a spiral. The design of the WTC was unique, in that it was, basically, a cylinder of steel girders with cross beams riveted to them to provide support for the floors. When those floor joists were damaged, and the floor removed by the impact, this turned quite a few floors of the tower into a chimney – which pulled in air, and helped fan the flames. Gravity does not pull at an angle. The WTC towers were two, very tall, cylinders, standing on end, on a fairly tiny foundation. They had been built just as perfectly vertical as possible, to minimize stresses and ensure that they would not self-destruct. So…when the support beams partway down the tower started to warp and bend, as a result of softening from the heat, gravity pulled the top floors straight down. Once the process started, there was no stopping it, as each floor destroyed added to the weight of debris falling. As the pile-driver piston that was the upper floors hit a lower floor, it would cause a spike in the air pressure on that floor…This, along with the impact of the debris, which started the tempered glass windows shattering, caused the glass to blow out and away from the tower. This seems to be the main “evidence” that the towers were imploded. I find the idea that our government could create an event like this, and keep all evidence of their plotting from coming to light for this long to be so amusing as to be like watching the clowns at the circus. The Government is just not that competent at keeping huge conspiracies like this as a secret, and I have yet to see any evidence that they COULD do this. Time and time again, leaks by the hundreds of Elected Representatives have revealed events that we have been in control of, and shown what foolishness we, as a Nation, have gotten into. I could go on, and I certainly admit there were some puzzling things that happened on that day. However, the explanation that it was a disaster caused by the madness of people driven to extreme action by America’s actions, is far more reasonable than the theories this this was a “False Flag” operation by our government, to try and manipulate the American Public. Frankly, we were not a lot brighter 15 years ago than we are in 2016, and look at where we have ended up! The Conspiracy Theory claims about the WTC destruction, how it happened, why it happened, and who benefitted are all extraordinary claims. Therefore, they require extraordinary proof to justify moving beyond the simple fact that it was an attack by a few madmen, programmed by fanatics who hate what America stands for, and what our Society provides. So far, I have yet to see any such proof. I see much speculation, and “What if” type questions raised, and strongly worded opinion pieces, but nothing is ever provided to prove these claims. This entry was posted in Ethics, General Thoughts, Humanity, Nuttiness, Political rants, Questionable decisions, Ruminations and tagged 9/11, Conspiracy Theories, Loonies, World Trade Center. Bookmark the permalink. Bravo for the rational mind.